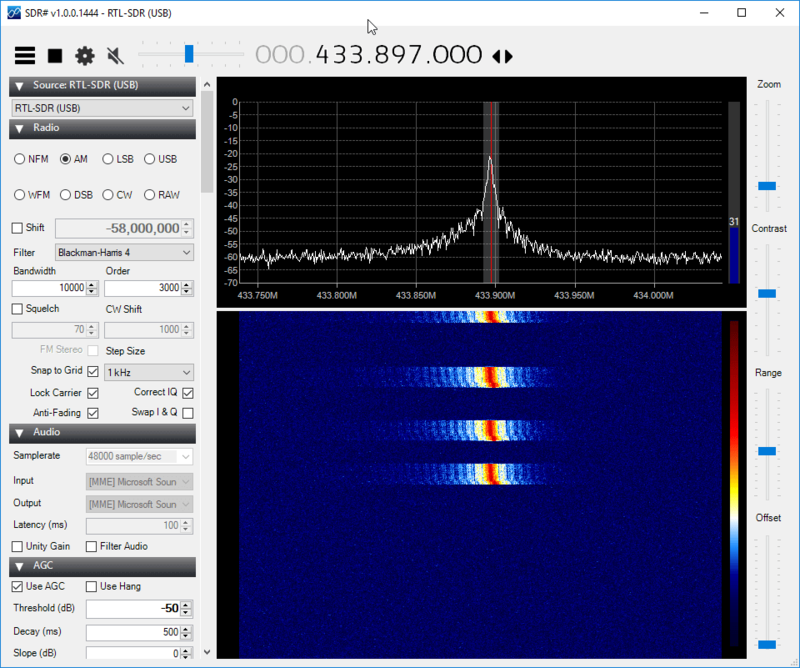 In this tutorial we will show how to perform replay attacks on simple OOK modulated 433 MHz ISM band devices using an RTL-SDR dongle and RPiTX. The RTL-SDR will be used to record an AM audio file of the signal, and then RPiTX will do it's magic to transform that recording into a file that can be transmitted back on the same frequency via one of the Raspberry Pi's GPIO pins. Installation instructions are available on the RPiTX GitHub page at https://github.com/F5OEO/rpitx. It's very simple to install as all you need to do is clone the repo, and then run an automated install script. We need the Keenerd version of RTL-SDR as his version provides an option which allows us to output rtl_fm data with a WAV header, allowing us to record directly to a wav file using sox. Using receiver software with a visual spectrum analyzer and/or waterfall like SDR#, GQRX, HDSDR or SDR-Console determine the exact frequency and bandwidth of the digital signal that you want to copy. For example in the image below the center frequency of the signal is 433.897 MHz, and the bandwidth is about 10000 Hz (10 kHz). Also you may want to determine the optimum RF gain settings. Be aware that many cheap remotes are not particularly frequency accurate and the frequency can change slightly just by the position of your hand on the remote. So be consistent with the way that you handle the remote to ensure that you're always on frequency. Example of a 433 MHz device transmitting. When ready, run the following command on your Pi, press the button on your remote, and then press CTRL+C on the keyboard to stop the recording. Make sure to change the frequency (-f), bandwidth (-s) and gain (-g) to what you determined earlier. This command will record an AM 48 kHz wav file of your keyfob signal. 48 kHz is what RPiTX expects. Normalizing the audio brings the volume up to the loudest it can be without distorting the waveform. This must be done otherwise the RPiTX output will be weak. Use the following sox command to create the myrec_n.wav normalized wav file. If you have speakers plugged into your Pi or the HDMI monitor attached to your Pi, you can optionally use the following command to test the recorded audio. You should be able to hear the signal audio playback. This step converts the wav file into an RFA file, which is a file format used by RPiTX when transmitting. The RFA file format seems to work much better than the IQ options for AM OOK signals. Use the following command to transmit with RPiTX, ensuring that you set the frequency to the correct value for your wireless device. Make another longer recording with the button pressed down for longer. Play with the normalization, e.g. try --norm=0 vs --norm=-3. Ensure that you have a wire attached to the correct pin. Try the alternative RPiTX pin with the '-c 1' flag. Installed software per the instructions, can record wav file. But cannot convert it, ‘piam’ command not found. Can it be used with devices with ask modulation? Also, I set a frequency of 433.86M and it shows it’s tunned at 434.23M…why is that? Do you mean when you transmit it’s off frequency? The Raspberry Pi doesn’t have an accurate clock, so it could be off by a bit. I tried your example, but I think the sampling rates aren’t correct for me. When I do it with HDSDR, the input sample rate is 2MHz, which is not an allowed sampling rate here. Any solution or procedure to try? 2 MHz is the SDR sampling rate, not the audio sample rate. I guess in HDSDR you could record the sound file, then sample it to 48 kHz in Audacity maybe. Can you capture and transmit at 303.875 frequency as well? Yes most likely. 303.875 is in the RTL-SDR and RPiTX’s range. hello, sorry but what is the gpio antenna wire pin? no its actually GPIO_18 which is pin 12. Thanks for this guide, I really had to try this! It works semi-successfully. For some reason I can only switch the 433 mHz remote socket on. When I try to replay the off-signal, nothing happens. I have tried several times with different recordings. What could be the reason for that? 1) When you replay the command, you use 434.004 mHz while you record at 433.897 mHz. Is this just a typo, or is there a reason for it? 2) How do you determine the bandwidth to be 10 kHz? One of your signals is within the receiver’s tolerance, the other is not. Rpitx is crap. You record a frequency, it transmits another. Totally unstable. Even the best solutions to modify the CPU governor or use more stable C libraries are below the lowest level of any practical use. Is this also possible on the BeagleBone Black? The RPi is a nonfree broadcom device i dont want to support by buying it. Would be great if it would also work with the BeagleBone Black (BBB). What is your point out the Pi? All CPUs are private technology, as are the mainboards for all microcontrollers, they are all patented. So I am not sure I understand your point about RPI is a nonfree device… all variants Pis, Beagles, etc.are nonfree based devices. You have to use private (owned) technology in all of them. It would be interesting to see a comparable RF waterfall capture of the RPiTX output. Can you tell as what is max tx output power that you can get…. 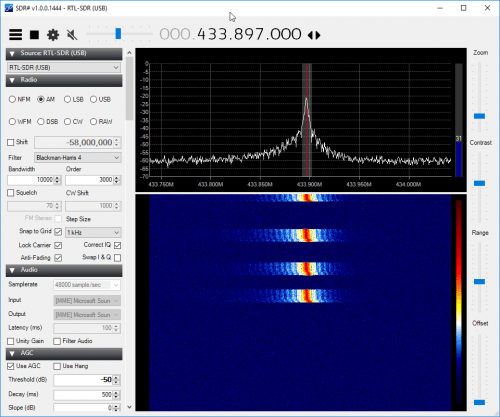 Are you using the Keenered version of RTL-SDR? https://github.com/keenerd/rtl-sdr. Only this one has wave header output as far as I know. 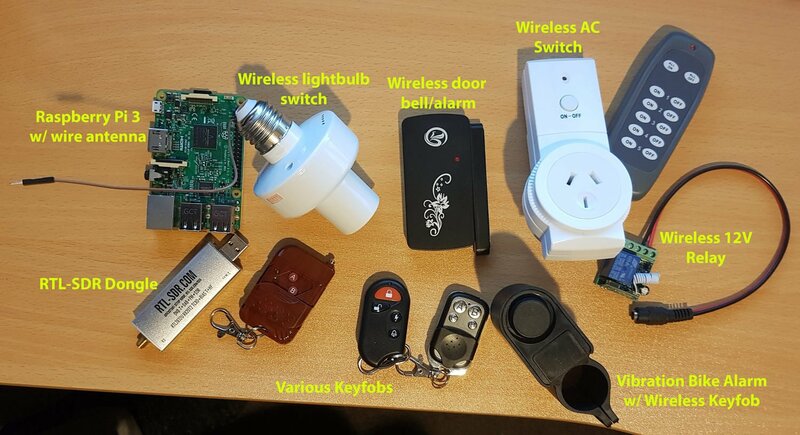 You readers might also find this interesting http://www.securipi.co.uk/remote-433-receivers.pdf – it uses inexpensive 433MHz or 315MHz receiver and transmitter boards connected to a Raspberry Pi and doesn’t require the filtering you talk about in the article, and allows capture & replay of standard AM OOK signals.